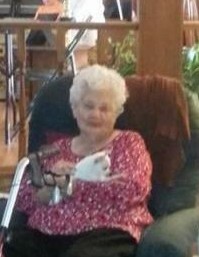 Mrs. Bessie Lou (Kilpatrick) Edwards, of Andalusia, passed away Monday, April 15, 2019, at her residence. She was 92. Mrs. Edwards spent numerous years working as a home health nurse. Graveside services will be held 1:00 P.M. Wednesday, April 17, 2019, in Adellum Baptist Church Cemetery (12514 Brooklyn Rd, Andalusia, AL 36421). Rev. James Brooks (her nephew) will officiate. Asked to serve as pallbearers: Jamie Jones, Jason Hines, Donnie Odom, Corey Lingrosso, Jacob Lingrosso, and Jacob Jones. Mrs. Edwards is survived by her son, Ronald (Cheryl) Edwards of Andalusia; her daughters, Debra (Sonny) Jones of Babbie, Stephanie (Danny) Richburg of Onycha, Edwina Edwards of Andalusia; her grandchildren, Karen Norsworthy, Jamie (Julie) Jones, Angela Canant, April Favors, Beverly Edwards, and Jason Hines; 13 great-grandchildren; and 1 great-great-grandson. She was preceded in death by her parents, Thomas Frank and Annie Mae (Lassiter) Kilpatrick and her husband, Grover M. Edwards in 2013, and also her 16-year-old chihuahua, “Missy” that passed away last week. Please join us in remembering Mrs. Edwards by visiting her memorial page at www.keaheyfuneralhome.com. We invite you to share your memories and words of comfort with her loved ones there.